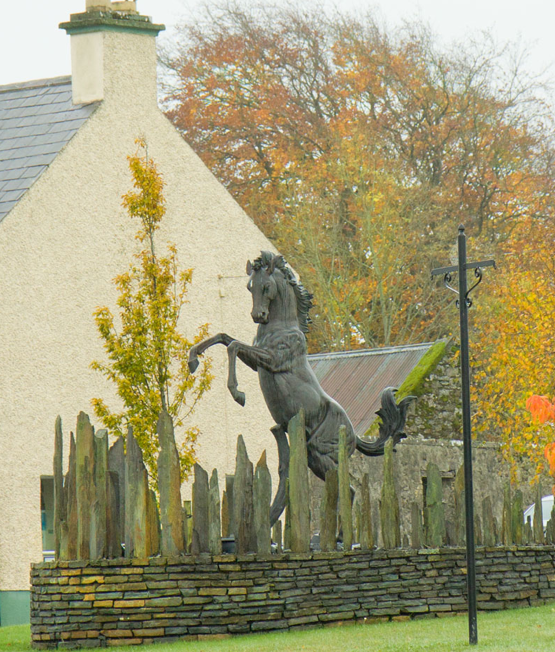 There has been some fun and games in the last 24 hours regarding the statue of a prancing horse that is to be found at a small Irish town called Horseleap, which is located slap-bang in the middle of Ireland, on the border between the counties of Offaly and West Meath. This was once on the main Dublin-Galway road, but was bypassed recently when the new M6 motorway was opened. The excitement has been created because of the suggestion that the 12 foot high bronze statue that stands on the village green was actually made by Ferrari and ended up in Ireland by some curious twists of Fate. I was alerted to the story by my friends at www.grandprixdiary.com and decided to investigate. The urban legend is that Ferrari traditionally presents such a statue to each of its drivers and that in 1999 one of these was created for Eddie Irvine. The story goes that it was shipped to Northern Ireland, as a surprise gift for Irvine but was not given to him after he decided to join Jaguar Racing for 2000. It was then stored in a barn in County Tyrone, which is to the west of Belfast and nowhere near Irvine’s home town on the east coast in County Down. A local farmer from Horseleap, visiting Tyrone to buy cattle, was told about it and a deal was struck with Ferrari for the statue to be sold to the village. Ferrari’s reaction to this story is as follows: “We do not know anything about it…” and when asked whether there was a tradition of giving statues to drivers, replied “for sure, not for the last 20 years”. For sure next week will be a peregrinage site for the Ferrari fans to celebrate the championship. A bit of good old Irish blarney here I think! Statues given to drivers!? Can you imagine Nigel Mansells face at the presentation ceremony! I think given Ferraris tradition of falling out with drivers there would be a warehouse full of these somewhere near Maranello. Is there some sort of competition at Ferrari over how many times they can say “for sure”? Could be a good drinking game..
You old cynic you! The local council seem to confirm the story. Allegedly. Sounds like a touch of the Blarny to me! Are there any other of these statues dotted around the world after being presented to former drivers? This is quite an unusual tale, but has given me reason to visit Horseleap if I’m ever up that way. I passed that statue a thousand times – usually going at 5mph caught up in the traffic jams that plagued Horseleap and all the other villages on the route. Very happy that the motorway is there, although it was a cool landmark! I always doubted that it was true but enjoyed spreading it nonetheless! Maybe thats the reason Eddie made the jump to Jaguar, tio try and get out of having a giant gift wrapped horse delivered on his doorstep. I’m Irish have no idea what a “blarny” is. Could someone please explain? I’m fairly sure a years ago Jody Scheckter did some F1 commentary for ITV at Imola. He told the story about how – after his championship year – the drivers were awarded small horse statuettes but that his appeared to have had an obviously broken leg welded back on (needless to say Gilles’s horse was perfect). How much is the local counci paying Eddie not to deny the story? How do you come up with these stories? Berger’s probably got one…………..and he’s spending a lot of time on it. If the story were true we would have heard about it before because I’m sure Irvine would have done something outrageous with this statue! If this really is Eddie`s horse. Were is Michael`s. Let’s hear from someone in Kerpen. Cool story! I miss Eddie!! I just love this story and would like to believe it! I thought Eddie might have had it positioned on the front lawn of his new house!!!!!! on second thoughts that would not be typically Eddie————–surprised he didn’t find something outrageous to do with it!!!!!!!!!!!!!!!!!!! Another version of the story is that after moving to Jaguar, Irvine woke up in the morning to find the head from the horse statue in the foot of his bed.